In the mid-1970s a large ice-free area in the Weddell Sea east of the Antarctic Peninsula was observed by satellites during winter. Now, 40 years later, the phenomenon shows up again. Its recurrence supports climate model studies by a research group at the GEOMAR Helmholtz Centre for Ocean Research Kiel, who identified the so-called polynya as part of natural climate variability and explained its causes and effects in several publications in recent years. Currently, winter has still a firm grip on Antarctica. 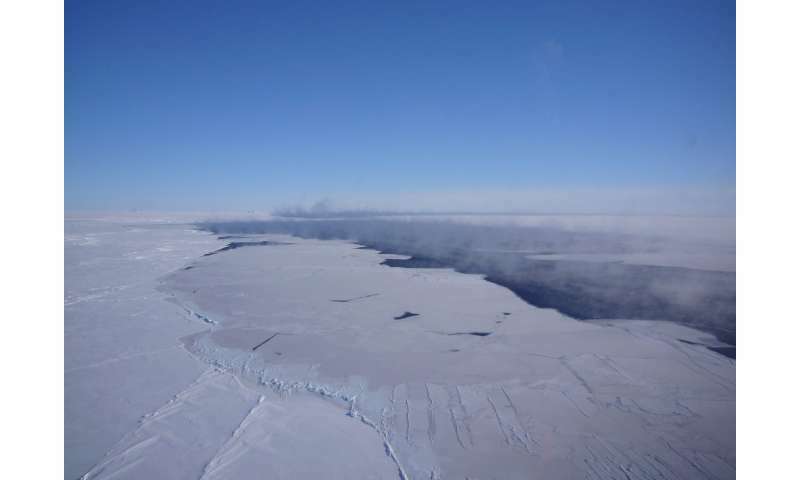 At this time of the year, the Weddell Sea usually is covered with a thick layer of sea ice. In spite of the icy temperatures in the region, satellite images depict a large ice-free area in the middle of the ice cover. The area of the hole in the ice is larger than The Netherlands and it fascinates climate and polar researchers worldwide. Scientists from the GEOMAR Helmholtz Centre for Ocean Research Kiel are closely monitoring the developments. "For us this ice-free area is an important new data point which we can use to validate our climate models. Its occurrence after several decades also confirms our previous calculations," says Dr. Torge Martin, meteorologist and climate modeler in the GEOMAR Research Division "Oceans Circulation and Climate Dynamics". Polar researchers refer to a large ice-free area in otherwise frozen seas with the Russian word "polynya". In the Arctic and Antarctic, polynyas occur regularly, but typically in coastal regions. They play an important role in the formation of new sea ice and deep water. In the open ocean, however, polynyas are rare. The so-called Weddell Polynya only once has been observed during the satellite era, namely in the mid-1970s. "At that time the scientific community had just launched the first satellites that provided images of the sea-ice cover from space. On-site measurements in the Southern Ocean still require enormous efforts, so they are quite limited," says Dr. Martin. Nevertheless, the Weddell Polynya is reasonably well understood. "The Southern Ocean is strongly stratified. A very cold but relatively fresh water layer covers a much warmer and saltier water mass, thus acting as an insulating layer," explains Prof. Dr. Mojib Latif, head of the Research Division at GEOMAR. Under certain conditions, the warm water of the lower layer can reach the surface and melt the ice. "This is like opening a pressure relief valve - the ocean then releases a surplus of heat to the atmosphere for several consecutive winters until the heat reservoir is exhausted," adds Professor Latif. Yet two major questions remain: how often does the polynya occur and does climate change influence this process? "If there are hardly any observations, computer models help to simulate the interactions between the ocean, the atmosphere and the sea ice," explains Dr. Annika Reintges, first author of the most recent study by the Kiel group about this topic. The models apply fundamental physical laws to simulate climate. Real data such as the bathymetry and actual climate observations used as a starting point provide a framework in which the models run. However, data uncertainties lead to a range of results. "Therefore, we are always trying to compare the simulations with real phenomena to improve the models. Unfortunately, many data series are too short to evaluate the simulated climate variability with periods of several decades. We therefore also compare the models with each other," says Dr. Reintges. US-American scientists have calculated that the Weddell Polynya would probably not occur again because of climate change. Higher precipitation levels in the region and melting ice would decouple the surface from the deeper water layers. However, in several studies applying the "Kiel Climate Model" and other computer models, the research group in Kiel described the polynya as part of long-term natural variability, which would occur again sooner or later. 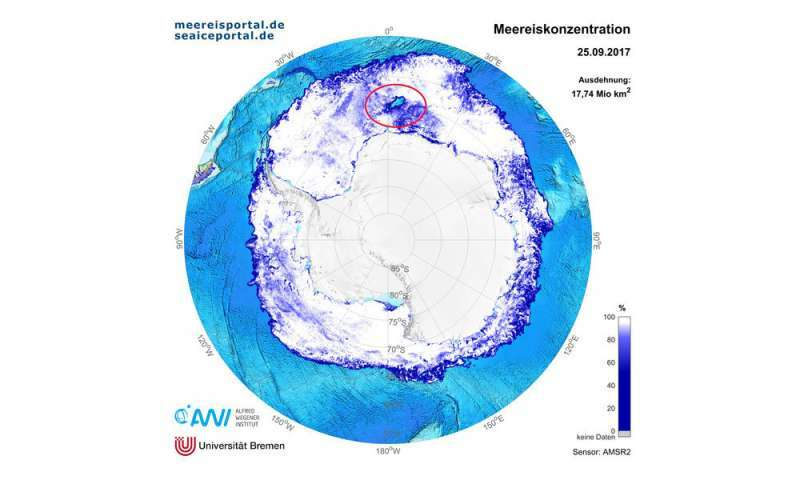 "The fact that now a large, ice-free area can be observed in the Weddell Sea confirms our theory and gives us another data point for further model studies," says Dr. Martin. In general, the climate scientists at GEOMAR, like many colleagues around the world, are keen to differentiate natural climate variability from manmade changes. "Global warming is not a linear process and happens on top of internal variability inherent to the climate system. The better we understand these natural processes, the better we can identify the anthropogenic impact on the climate system", resumes Professor Latif.